Caring for a pregnant miniature mare is similar to caring for a pregnant mare of a larger breed. You need a nutrition plan, worm control and vaccinations. Miniature horses have more difficulty producing foals than larger breeds, so it is vital to keep an eye out for impending birth, which occurs 320 to 340 days after mating. Always plan to be in attendance for the birth and make sure you have phone numbers on hand for your vet. Note the date the mare was serviced by a stallion and arrange for your vet to conduct a pregnancy test about six weeks later. Ask your vet what vaccinations will be required; this will vary depending on your area but will almost always include a tetanus shot. Write the dates for these vaccinations on your calendar and make sure to follow the schedule. Follow your normal feeding and exercise program for the mare. Continue your normal worming program, but ensure your wormer is safe for unborn foals. Avoid wormer with moxidectin. Arrange a second pregnancy test at five months to be sure the pregnancy is continuing and no internal problems have developed. Check your pasture for fescue, as grazing it can give your mare problems with placenta or cause her to abort in the last three to four months of pregnancy. Make sure your mare cannot access any fescue -- pull it out, mow it down or use electric fencing to quarantine it. Gradually add grain feed to her diet, starting with just a small handful, in the final trimester. Make sure she has access to a mineral lick and clean water at all times. Place the mare in the stall at night from day 300 and put a halter on so you can handle her quickly in an emergency. Attach a foaling alarm to the halter and keep the monitor in a place in the house where you will hear it when she lies down. Arrange for the final hoof trim before the birth. Make sure she gets let out for several hours a day. Do not let her get obese, as she will have foaling problems. Regularly disinfect the stall and keep the bedding clean and dust-free. Monitor her closely and keep the vet informed of her progress. Check her when the foaling alarm goes off. As labor commences, she may lie down and get up several times before her waters break. The nose and front feet of the foal should appear within 15 minutes. If no sign of the foal emerges within 30 minutes, you need to have the vet there, as the foal may need repositioning. Ensure the nose and mouth of the foal are cleared of any membrane as soon as it is born. Rub it with a towel to stimulate it and keep it warm. Encourage it to get to its feet and suckle. Get the vet to ensure it has no abnormalities -- miniatures are sometimes born with leg or joint problems.  Check for her udder developing, as this means the birth is days away. ⚠ Occasionally you may get a false alarm from the foaling monitor, but it is rare for a mare to lie down and stretch out when she is heavily pregnant unless she is going into labor. ⚠ Miniature horses have a much higher rate of foaling difficulties than other breeds, and not every foal is born live. Prepare for the possibility that both the mare and foal can die during the birthing process, and be sure your vet is aware of the impending birth. 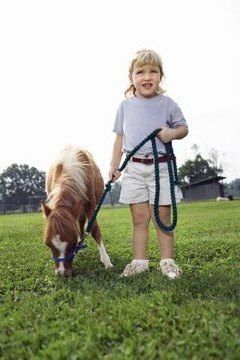 American Association of Equine Practitioners: The Miniature Horse: Not Just a Small Horse!